Big Love | Music | Style Weekly - Richmond, VA local news, arts, and events. 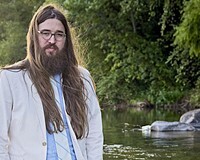 Peter McElhinney Matthew E. White plays the National on Oct. 9. 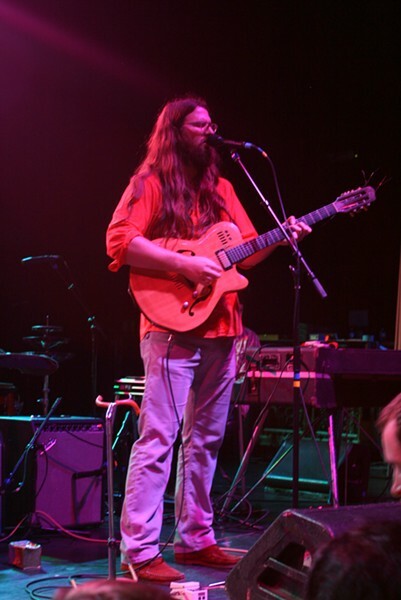 Matthew E. White performs at the National Oct. 9. The Alan Toussaint horns met the Talking Heads as hometown hero Matthew E. White launched his national tour with the Mountain Goats Tuesday night. The quiet, folky feel of his debut recording became full-throated alternative rock. Whatever rough patches might have existed in a first-time-on-stage performance was masked by the band’s huge sound and obvious enthusiasm. Some poetry gets lost in transition to the stage, but then again if you slacken for a second -- as in White’s quiet opening to “Gone Away,” a deeply spiritual song about the tragic death of his 4-year old cousin, some jerk in the crowd will be revealed talking loudly about nothing. John Darnielle, the ebullient lead singer of the Mountain Goats, had no patience with audience blather. He stopped once to admonish talkers, and a second time to offer to pay for the tickets of two particular offenders if they would leave. “I despise you,” he said, and then restarted the song, a sympathetic, seemingly nostalgic ode to addiction and petty thievery. Over nearly 20 albums Darnielle has combined his darkly specific poetry with Buddy Holly hooks to create a body of work that is both charming and bracing. During his long set at the National -- accompanied by longtime bassist Peter Hughes and slightly less longtime drummer John Wurster -- he mixed songs from the new album (the set was constructed around the two versions of “Spent Gladiator”) and older pieces that many in the audience greeted as old friends. Darnielle switched between keyboards and guitar, cut the band down to solo or duo and pumped it up with the Richmond horn section. Miss the show? Matthew E. White's performing Friday, Nov. 16, at the Camel with the Trillions and DJ Mixie. Musician Matthew E. White is leading the biggest potential breakthrough in Richmond's youthful creative renaissance.